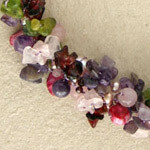 Knotted by hand on rayon, gemstones cluster in a multi-colored garland. 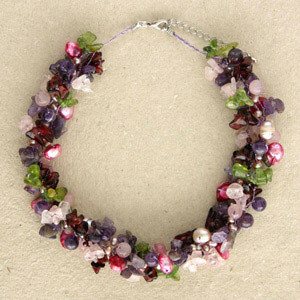 Sirada combines amethyst, garnet, rose quartz, peridot and pearls for this chic necklace. Its length is adjustable and it closes with a stainless steel clasp. 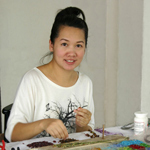 Materials: Amethyst, garnet, rose quartz, peridot, pearls, rayon and stainless steel.